Coal mine dust that is able to be breathed causes a range of diseases that are known collectively as black lung. Black lung can lead to lung impairment, permanent disability, and even death. While considerable progress has been made in reducing miners exposure to respirable coal mine dust, miners continue to develop these diseases. There has even been a rise in serious cases of these diseases occurring in younger and younger miners. A very good synopsis of the rule can be seen here. There will be six public hearings on the new rules over the next couple months. Members of the public will be able to make oral presentations and weigh in with their thoughts on the rules. Click here for the public hearing schedule. Convergence Training will be updating our MSHA safety training videos after the respirable coal dust public hearings are finished. That way we’ll be sure to understand all of the implications of the new rules for our mining customers. If you’re currently a Convergence Training customer (or if you might be one day), follow us on Twitter to stay up-to-date on our MSHA- and OSHA-aligned product releases and news. October is National Fire Safety Month. Get prepared by making sure your collection of fire safety training materials is complete. 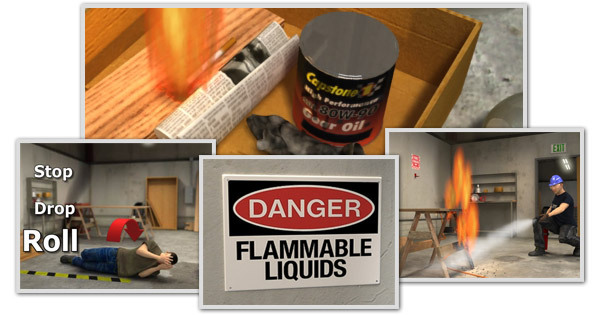 Convergence Training has two CBT fire safety training modules to help keep the flames at bay: Fire Safety, a 23-minute module focused on 29 CFR 1910 Subpart L, and Fire Extinguisher Safety, a 14-minute module focused on 29 CFR 191.157. See a clip from our Fire Safety training video on YouTube. Both CBT (computer-based training) modules are SCORM compliant and feature the state-of-the-art 3D animation that has made Convergence Training the industry leader. Visit www.buybettertraining.com to view samples and purchase copies. Fire safety isn’t just important—it’s historically interesting, too. Convergence Training’s crack research department has dug up two fire-related historical factoids for you. National Fire Safety Month has its roots in the devastating Great Chicago Fire of 1871. Read more about the Great Chicago Fire here. The fire is represented by one of the four stars on the flag of the city of Chicago – read more about the flag here. 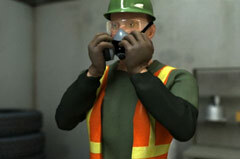 In case you missed it, the folks at OSHA recently held a “virtual stakeholders” web chat to discuss issues related to upcoming combustible dust regulations with concerned industry members. In the chat, OSHA explains that their “next step is to initiate the review under the small business regulatory enforcement fairness act (SBREFA) in April 2011.” Until then, check the chat history at http://www.dol.gov/dol/chat/chat-osha-20100628.htm, view the follow-up questions on the Department of Labor’s new blog at http://social.dol.gov/blog/ (try searching for “combustible dust” at that page), and stay tuned for more from OSHA in April, 2011. The new OSHA regulations on crane operation and certification just came out last week. Understandably, there are a lot of people interested in how this will affect them. In OSHA’s words, “approximately 267,000 construction, crane rental, and crane certification establishments employing about 4.8 million workers will be affected by this rule.” It’s one of OSHA’s biggest regulation overhauls in decades. The new regulations only affect work having to do with construction. General industry work is not affected and will remain governed by the current standard. It’s important to understand the nature of what constitutes “construction work” by OSHA standards. If you are not familiar with these distinctions, I’d recommend reading this OSHA document on construction vs. maintenance/service work. You can read the full OSHA regulations by clicking here. If you’re very interested, you can read more about how the new regulations were agreed upon and how the specific changes were made by clicking here. Also, there’s a really good question and answer session OSHA held recently that’s very informative. We’ve ramped up our production schedule to get out our new crane training modules out as soon as we can. We’re currently working on getting the storyboards aligned with the new rules. Two of our planned modules are entitled “Overhead Crane Training” and “Mobile Crane Training”. We’re also considering modules specifically about working around electricity and assembling/disassembling booms, because those are the two leading causes of death in crane-related incidents. We also might add a general module about rigging and slings. Overhead cranes aren’t affected too much by the new OSHA regulations, just because the new regs only apply to construction work, and not to general industry. Mobile cranes and tower cranes will of course be greatly impacted. All regulations related to crane maintenance, crane operation, and qualifications for signalpersons and riggers will take effect November 8, 2010. Crane operators will have up to four years to meet the new certification requirements. Convergence Training is bringing safety training tools to just about any business. Soon, pretty much any company will be able to train, track, report, and get important notifications anywhere at any time for way less than a trip to the ER. Convergence WebExpress is our new Internet-based training delivery and management system. It’s an online learning management system, or LMS, without the expensive servers or sophisticated software. Keep reading to find out more. As veterans of complex technical LMS installations, we’ve known for years that a company’s fundamental training needs don’t change as they grow. They just get bigger. They just need more people trained more times in more places with reports sent to more people. And while just about any organization could benefit from the features provided by many LMSs, the costs of these systems fall astronomically beyond the budgets of most small to medium sized enterprises. So in the past, you had to be big enough to justify the hardware and software investment. For less than 10% of the cost of the average emergency room visit, any company will be able to access our entire library of courses to train an employee for a full year. That’s all 28 Environmental, Health and Safety courses and our complete set of 27 Surface Miner Training topics. You’ll get a scalable solution and cost structure that fits your budget with a versatile set of courses and centralized training management tools. Administer required training anytime, anywhere via the Internet. Since it’s online, we can update or add training content at any time. No more 80’s VHS tapes or scratched DVDs to deal with. No in-house IT resource costs. Just relevant, affordable, accessible, and effective training. Give us a call or send us an email to get a free demo account set up. Kick the tires and make sure it’s right for your business. No strings attached. The course catalog inside of Convergence Training Viewer has been updated with a preview of our driver safety series courses (Defensive Driving, Seatbelt Safety, and Vehicle Preparedness). While these courses are still under development, we wanted to include them in our catalog to show everyone what is in the works. 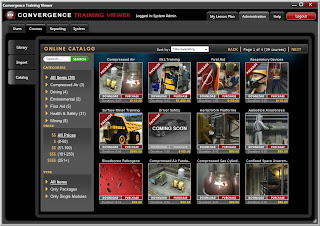 Did you know that Convergence Training Viewer is a free mini-LMS for your desktop? It can import courses, track results, and even track non-computer training events – and its FREE! Check it out or give us a call today. We would love to get your feedback. Just last week, I was asked for a list of the top blogs/learning resources that I follow/frequent. Here is a list of the 5 sites that I have found helpful and full of great information. I subscribe to these via RSS which will deliver updates directly to Outlook and my phone. What are some of your favorite eLearning or training sites? Drop me an email or comment and let me know what I’m missing out on!